Japanese Drummer at Festival 2007. One of my favorite seasons in Japan is the summer, lots of outdoor activities and festivals everywhere. Here in the summer of 2007, traditional Japanese drummer provides music from his drum(taiko) beat to dancers at the festival. 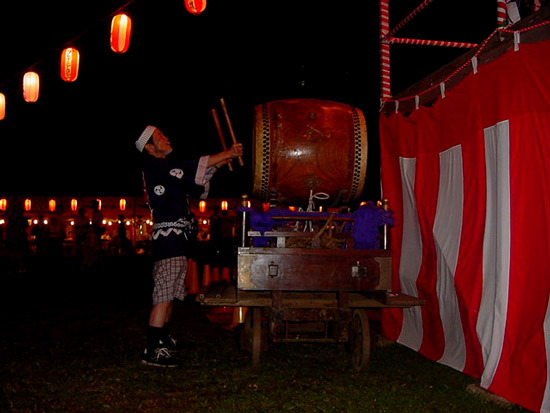 The festival continued into the night and the local or traditional hanging-lanterns not only lit up the surroundings but also added to the beauty of the festival. There was plenty of beer to drink and lot of chicken barbeque or "yakitori" to eat. Also on display were various form of souvenirs.